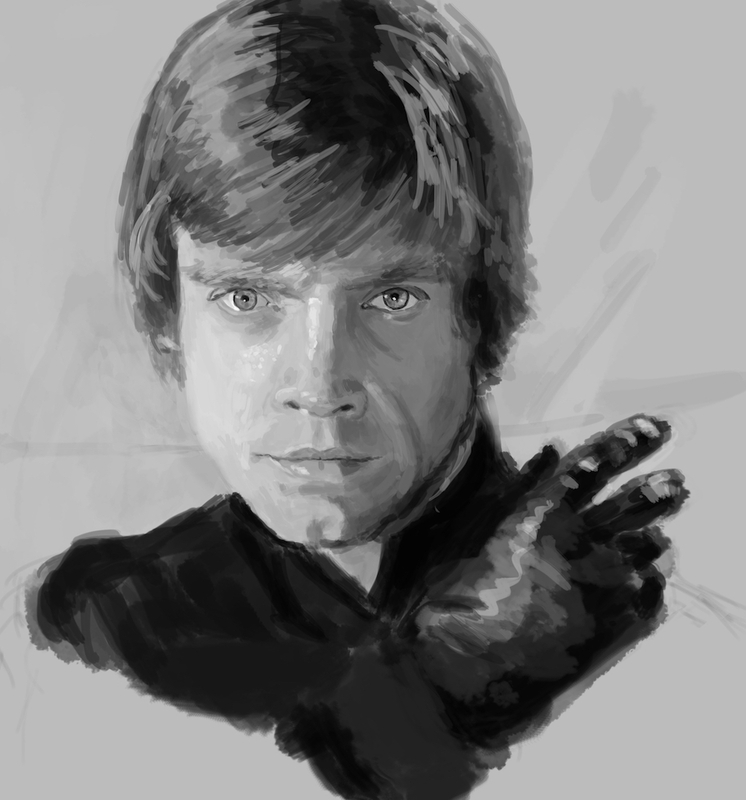 I will post an in-depth review of the course later, but for now I can say it does exactly what it says on the tin: If you want to learn how to paint portraits so realistic they look like they could jump out of the canvas and punch you in the face, this the course for you! Individual hairs are extremely fine, but put them together and they start behaving like a solid, shiny mass, almost like a bunch of ribbons. To paint these “ribbons” you’ll want to use a big brush to block in the midtones, shadows and highlights. Afterwards, you can go in with a super fine brush and add some details, like a stray lock, to really “sell” the idea of hair. However, if you go into the painting thinking that you’ll paint hair instead of ribbons it’s easy to fall into the trap of painting the hair as individual strands. Either you’ll use a super tiny brush and slowly drive yourself insane, or do something in-between with a medium-sized brush. It’s very time-consuming and doesn’t look great (see below for a comparison). The great James Gurney also has a post about the “hair as ribbons” idea on his blog. In conclusion, don’t paint hair—paint ribbons! 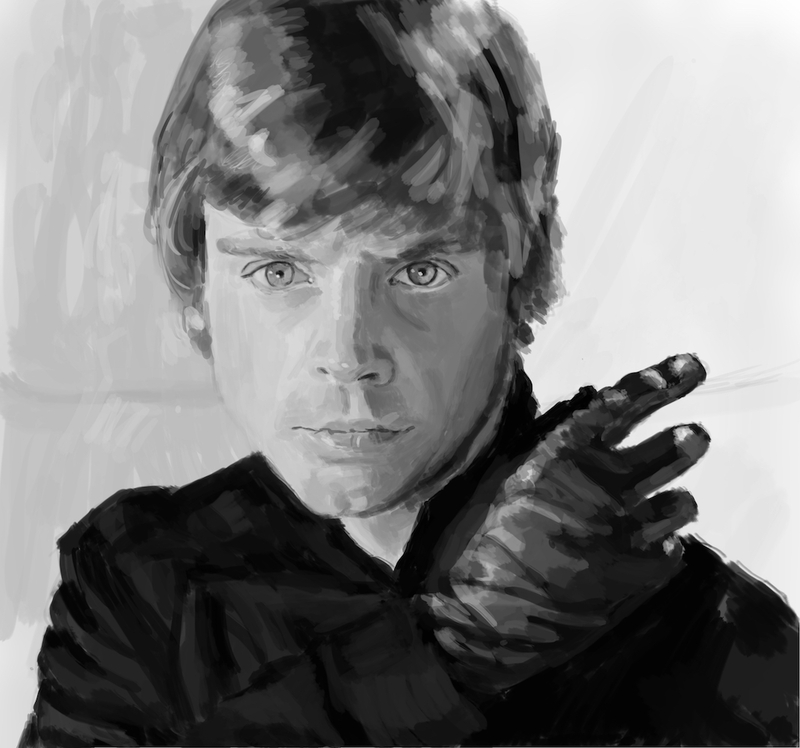 Two paintings of Luke Skywalker for the Realistic Portraits course. In the left one I’ve painted something between large shapes and individual strands. In the right one the hair is painted loosely and more like a solid mass, which I think looks way better. Whenever I wanted to take a note I had to resize the video (which was playing in full screen on my laptop, for that 13’’ home theater experience). It’s easier to retain information if you write it down on paper. While this might sound like a wild, speculative claim, I’m sure there is ample scientific evidence supporting this, involving micro-crystals and “ley lines”. For something as visual as painting, drawing becomes a highly effective way to take notes. This is way easier on paper. My current setup consists of a pen, mechanical pencil and a set of cool grey Promarkers. I do all my writing with the fineliner, and sometimes use it for drawing. For more complex drawings I use the pencil to draw a sketch, then block in values with the Promarkers. I also have a white gel roller that I use for highlights. For digitizing my notes, I use the excellent Scannable app for iOS and then upload them to Dropbox. If you read my last blog post you’ll remember that I set some New Year’s resolutions for 2018. Having concrete, short-term goals has turned out to be great for motivation and giving me a sense of direction. Don’t work on too many goals at the same time—you’ll just spread yourself too thin. Be ambitious—what would you aim for if you were guaranteed to succeed? Visualize yourself having already achieved your goal. What would it feel like? This is a great source of motivation you can tap in to. Would the end result be worth all the trouble you would have to go through? If not, choose a better goal. If you don’t have a course you want to finish you could do something else, like a 21 day challenge where you focus on one specific area of your art that you want to improve. Hope you’ve found these highlights useful—if you want more posts like this, or just want to leave some general feedback don’t hesitate to reach out, either in the comments field below, or on social media. I’ll be back next month with a new post. Until then, you can reach me on Instagram at @christofferekeroth and Twitter at @chrekeroth. Hope to hear from you!